Transdev, the UK’s leading mechanical power transmission specialists have introduced a range of BRECOflex timing belts. These endless polyurethane timing belts are suitable for precision positioning and speed control applications.Manufactured by Breco, the new Brecoflex StandardPlus range combines improved manufacturing technology for higher tooth-pitch accuracy with its unique bifilar, S & Z wound, steel tensioning system which greatly reduces belt run-off. The net result is a competitively priced, endless timing belt system that can be applied to positioning applications previously thought to be the domain of standard grade rolled ball-screw technology. During a series of tests carried out by Breco, the best accuracy results were obtained with belt lengths starting from 2500 mm, where a positioning precision within the range of +/- 0.03 to +/- 0.05 mm per metre of travel was achieved. When testing the StandardPlus range against existing “real life” applications; comparative “old and new” recorded accuracy improvement was at least two and a half times better and in some cases as much as a seven fold improvement was attained. Bifilar S & Z wound steel tension members are used in all Breco timing belts. Multiple steel cords are arranged in groups and twisted in opposing directions helping to reduce lateral reaction forces and minimise belt run off. This unique winding method also allows the polyurethane to fully penetrate the tension members and is a major contributor to the superior bonding of the belt ends in the joining process. In addition to reduced belt tracking forces, other benefits such as reduced belt edge and pulley flange wear, reduced audible belt noise and longer life are achieved. Furthermore, reduced friction also allows for improved servo motion control in demanding positioning and speed control applications. Alternative manufacturers of polyurethane belt systems use single wire tension members that are more prone to belt run off and suffer from unpredictable wear and friction characteristics, resulting in shortened life, increased noise and higher maintenance. 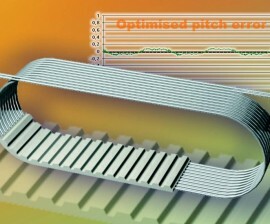 Advances in manufacturing and production control techniques now allow the Brecoflex StandardPlus timing belt to boast improved tooth to tooth pitch accuracy over the standard range with pitch stability reduced from 0.7% on a typical timing belt to less than 0.2% on a 3000 mm length StandardPlus belt. Breco timing belts are used on a very wide range of applications with a proven pedigree for high reliability and superior power transmission characteristics. Available in open lengths of T2.5, AT3, AT5, T5, AT10, T10 and T20, the range can be customised with full manufacturing of standard & special Breco belts direct from Transdev in Poole. Breco belts are available in a wide range of configurations including single or double sided versions, reinforced belt backings, anti-static, coloured, machine ground and punched versions. Transdev also manufacture matching standard and customised pulleys for the complete Breco range. The new StandardPlus range will suit automation applications where higher precision at moderate cost is required such as robotic pick & place systems, linear positioning tables, tightly synchronised conveying systems, on-the-fly ink jet printing, cut to length and other precise packaging and labelling requirements.